It’s dotted with sights of historic interest too, from cairns to megalithic tombs. Well worth the effort! 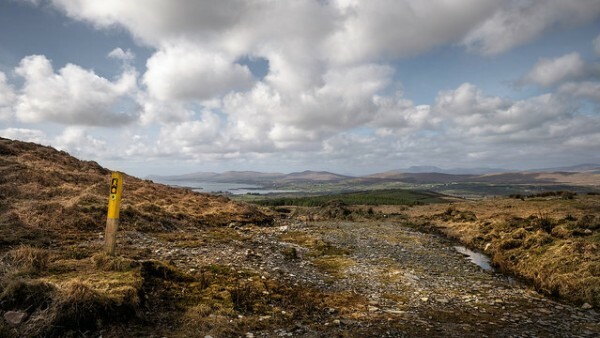 To begin the Mount Corrin Loop Walk on West Cork’s Sheep’s Head peninsula, set out from Durrus village along the old creamery road passing Wiseman’s hardware store on your way. 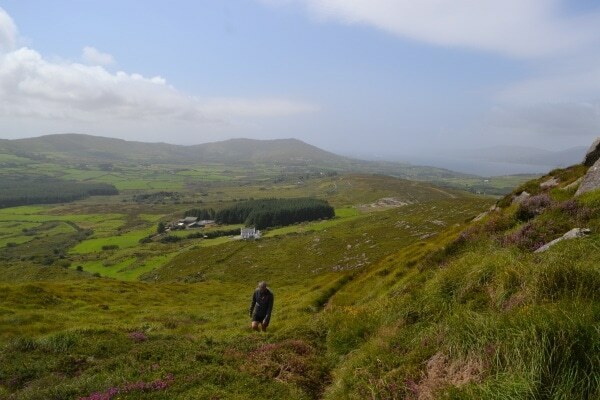 The well-signposted walk is part of the Sheep’s Head Way hiking route on Ireland’s southwest coastline. Continue on along the road for a good while until you reach way marker no. 570 on a telephone pole, take a right here and go up another road. At way marker no. 572 you will go off road and through farm land and tracks until you will arrive at a timber stile, way marker no. 600 and a gate with an information sign on it. Go right after going over the timber stile and continue along the road until you reach another timber stile, way marker no. 603. Go left over the timber stile and onto the land, continue on up until you reach way marker no. 619 and take the Mount Corrin option which is straight on ahead and over a timber stile. Continue on up along. Further on down, you will reach an information sign beside the road and take the Mount Corrin/Dunbeacon option. Across the road you will see way marker no. 397 and from here you will set out for Mount Corrin. On reaching the summit you will descend down onto the Mine Road via a timber stile way marker no. 975. (There is an information sign here also at this point, so you can opt for going back to Durrus village or the car park at Dunbeacon Church). Take a right here along the road and continue on until way marker no. 976 on a telephone pole, if you want to go to the car park at Dunbeacon Church turn left here and the road will lead you there. Continue down the Mines Road. (To the left is a marked path to the Dunbeacon Stone Circle if you wish to visit it, adding about 1km to the route. A short distance further on, to the left, is a short path to the Coolcoulaghta Stone Row). Just before the Mines Road meets the R591 road to Durrus, look out for a stile on the left. This will take you across fields and a boreen to another small road where you turn right. Follow this road to the T-junction where you turn left and then left again at the next junction before turning right onto the R591 road which will lead you back to Durrus village from where you started. Note : Be aware of weather conditions and cut away peat bogs along the loop walk. Be aware of any livestock on the land, especially any bulls. Please do not exit marked trails. Stay on marked routes, and remember that no dogs are allowed on the Sheep’s Head Way. The Mount Corrin Loop Walk is one of 20 colour-coded Sheep’s Head Way loop walks. Start/Finish: Durrus Trailhead or Dunbeacon Church car park.